COLOGNE, Germany – Even with world unrest and a shaky economy, art auction houses in Germany are reporting strong year-end prices. The German Expressionist painters continue to be favored; an original the size of a postcard marked by their hand can fetch thousands of euros. The range of Wiking colors is startling: black; white and cream to beige, many shades of gray, dark and light red, blue and green; yellow and orange. Photo courtesy of Auktionhaus Saure. COLOGNE, Germany – It’s an exclusively small, male-dominated club. But instead of being united by school ties, this group has a passion for tiny wheels – Wiking models, to be exact. Sales at Auktionshaus Saure are always filled with casually dressed older men intently referring to the sale catalog. It’s not that women are intentionally left out. It’s just that these colorful plastic models were primarily the domain of West German boys growing up in the 1950s and ’60s. Auction Talk Germany: Can there be a silver lining to war? MUNICH – Sometimes stories of war and intrigue end with a silver lining – even if it means buying said silver back at auction. In 1945 Price Ernst Heinrich of Saxony and his two sons, Prince Dedo and Prince Gero, feared the worst and buried the family silver in the woods next to their home, Schloss Moritzburg near Dresden. This act was a common bet of fleeing wealthy families during World War II, who hoped to protect their treasure from both National Socialists and the approaching Russian Army. But the Duke of Saxony, son of the last King of Saxony, had a lot more to hide than just silver. Generations’ worth of costly and irreplaceable art treasures from the royal lineage of the Wettiner, part of which had been exhibited at Dresden’s famous Grünes Gewölbe, was at stake. With the help of French prisoners of war, the treasure was packed into 43 crates. The two princes buried most of it themselves. Although they bade their father for extreme secrecy, he told one other person, his forester, the location. When the Russians, they quickly pressured the location from the forester. Soon the bulk of the treasure, including the Baptismal Font of the Wettiners, was on its way to Russia. What no one else knew, was that three more crates had been buried nearby. They remained undiscovered until two treasure hunters found them using a metal detector in 1996. In 1998 a second stash was found. The crates contained especially precious works of art including the Moor’s Head Cup, a masterwork by Nurmberg goldsmith Christoph Jamnitzer (1563-1618), along with coins, cameos and heavy gilded silver serving pieces with the Saxon Crest. The treasure was auctioned in London in 1999. This spring, Hampel Fine Art Auctions, Munich, once again offered the vermeil pieces for sale. It was the chance of a lifetime for the Museum Schloss Mortizburg to buy their silver back. Lot number 477, the Silver Treasure of the Wettiner of Schloss, was estimated to sell for between 70,000 and 90,000 euros ($78,600-$101,100. Museum Schloss Mortizburg was pleased to be the winning bidder at a price at the lower end of the auction estimate. The centerpiece of the purchase is a large vermeil water kettle, its curved octagon panels featuring the Saxon crest. It perches on an ornate vermeil chafing stand engraved with the royal crown and the initials F.A.R. thought to indicate Friedrich Augustus Rex (1828-1902), also known as Albert of Saxony. On the bottom one can see the silversmith’s mark, Eckert; 1885, the year of production; as well as the usual inventory number and stamp of the royal silver chamber from the Zwinger, Dresden. For the serving of delicacies there is a large vermeil tea platter, a round serving platter and a pair of oval serving platters. Because the silver was made for a king’s table, there are some additional vessels for pure elegance. Two pairs of shell-handled vermeil strainers, two sets of four octagon saltcellars, and a pair of graceful handled sauce dishes complete the service. All of the pieces were made between 1880 and 1906, many identified as the work of Silversmith Friedrich Heinrich Emil Eckert of Dresden. “The preparations to display the pieces are in high gear,” noted Museum Schloss Mortizburg Press Speaker Uli Kretzschmar. 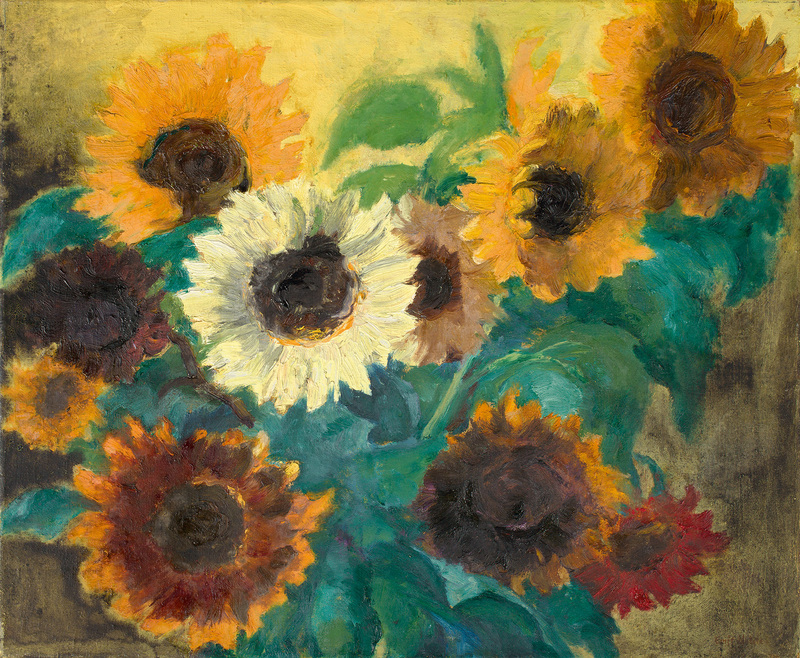 June 26: Art Auction, Schueblein Art & Auktionen, München. June 28: Art, antique and flea market offered on the grounds of Schloss Großkmehlen bei Ortrand. Through the end of June:Doebel Kunstauktion, Dettelbach-Effeldorf, aftersale of art from the 20th and 21st centuries. https://www.liveauctioneers.com/news/wp-content/uploads/2015/06/2015_0616_HampelWettinerSchatz3.jpg 2312 1772 Tom Hoepf https://www.liveauctioneers.com/news/wp-content/uploads/2017/11/ACN_logo_tranparent-revised-sm2.png Tom Hoepf2015-06-16 11:39:422015-06-17 16:06:58Auction Talk Germany: Can there be a silver lining to war? DRESDEN, Germany – A change of style or medium can be a career killer for an artist. Be an impressionist one day and an expressionist the next, or switch from painting to sculpture? Critics and the general public won’t know what to think. But two of Germany’s best-known contemporary artists have built their careers on new ideas. Gerhard Richter and Günther Uecker, now in their 80s, have thrived on a palette of change. Contrary to killing their careers, their work is highly sought after and their prices only climb. Richter and Uecker’s work can be viewed in two new exhibits this year. The Albertinium, part of the Staatliche Kunstsammlung Dresden, has had two rooms devoted to hometown son Gerhard Richter since 2004. These were recently updated by the artist. The Kunstsammlung is also keeper of the Gerhard Richter Archives, a cache of catalogs, correspondence and photographs. This documentation of Richter’s career is especially important because of his chameleon-like way of moving among different styles and media. The sheer volume of his work in realistic and abstract paintings and prints, a type of paper and photo documentation he calls “Atlas,” photographs, artist books, sculpture and installation work, and even film, is astounding. Richter’s work has been called “Capitalist Realism,” which amuses him. The moniker comes from a happening he created with artist Konrad Lueg in 1963. Richter had just defected from East Germany in 1961 where Socialist Realism prevailed, and decided “Manifesto of Capitalist Realism” would be a fitting title for the event. Certainly he has been commercially successful, setting auction record prices for a painting by a living artist in 2012 at $34 million (31 million euros); topped in 2013 at $37.1 million (33.9 million euros); and recently exceeded that in February, 2015, when one of his abstract paintings sold for $45.2 million (41.3 million euros) at Sotheby’s, London. Visitors to the Albertinium can now enjoy four new large abstract paintings by Richter Abstrakten Bilder (937/1-4). They resemble mirage landscapes of striated gray with flashes of red and green. Their somber feeling can be traced to their inspiration: photographs taken by a Birkenau camp prisoner in 1944. The holocaust is a revisited theme for Richter. In keeping with his fascination for mirrored images, the artist has added four full-size color photographs of the works, creating a reflected image between photography and painting. The 20-part color chart 180 Farben (1-20), 1971, is the core of Richter’s second exhibit room. Other new additions at the Albertinium include his daughter’s portrait, Ella, 2014, and the still life Tulips, 1995. Richter’s new exhibit continues through September. www.SKD.Museum. Günther Uecker’s Kunstsammlung Nordrhein-Westfallen exhibit at the K20 Grabbeplatz, Düsseldorf, is aptly titled Mehr als nur Nägel (More Than Just Nails). It’s easy to categorize Uecker as “The Nail Painter,” he is that inseparably identified with his nail relief images. The pictures are unmistakable – a pale painted background pierced with a pattern of nails, their three-dimensional aspect playing games with light and shadow, making the pattern appear to undulate. Yet Uecker is also a sculptor and installation artist. His use of words and text in his art adds the role of poet, designer and social commentator to his repertoire. Like Richter, Uecker fled East Germany, settling in Düsseldorf in 1953. He actualized his wish of studying with artist Otto Pankok at the Kunst Akadamie Dusseldorf. It was during 1956-57 that Uecker created his first nail picture. He began to use everyday objects, such as furniture, as his “canvas” for nail sculptures. As a member of the Zero Group, Uecker experimented with kinetic light sculpture. His Terrororchesters (Terror Orchestra) in the Kunsthalle Baden Baden was a memorably noisy installation that included 20 washing machines and reflected the banal background noise of life. Decades worth of Uecker’s nail reliefs are on exhibit in the Klee Hall exhibit of the Kunstsammlung Nordrhein-Westfallen. This is a chance to properly experience the power of these seemingly simple works; one must walk past them to appreciate the light and perspective changes that bring them to life. Terrororchester can be seen in the Grabbe Hall. Works with text that engage the viewer as reader include Brief an Peking (Letter to Beijing) and the Verletzungsworte (Wounding Words). In Sandmühle (Sand Mill) a rope rake perpetually spirals through a circle of sand. The simple materials and easy motion impart a universal message on the passage of time. But, as Uecker says,“Where language fails, the image begins.” With Uecker, you need to be present to receive the whole message. His work will be on view through May. www.KunstSammlung.de . Gerhard Richter, Abstrakte Bilder (937/ 1-4), 2014, Öl auf Leinwand, © Gerhard Richter Archive, Staatliche Kunstsammlung Dresden. Foto von David Brandt. Fotos mit freundlicher Genehmigung von S.K.D. Many of the Belsnickle candy containers, like this judgmental fellow, were glued together at the base for later use as a Christmas decoration. With his decorated tree and heavy coating of sparking micra, this Belsnickle still brought $9,500 at Dan Morphy Auctions’ September 2011 sale. Photo courtesy Dan Morphy Auctions LLC. SAXONY, Germany – Twenty years ago, Lorraine Jones of Peabody, Mass.,, told her husband she thought she would be content if she bought just one Belsnickle candy container. Forty-nine Belsnickles later, Jones has collected a small troop of the fragile German papier-mâché candy containers that bring her year-round joy. Belsnickle is no Santa Claus. Although his true origins have vanished with the Christmas snow, he is the stern character who visited children a few weeks before Christmas to see who was naughty and who was nice. His thin, scowling presence, a sack of goodies in one hand and a bundle of whipping switches in the other, was enough to terrify the goodness into any child. The German tradition dates back to a time when St. Nicholas and the Kristkind or Christ Child, represented as a blond angel dressed in white, made the rounds together. But after the Protestant Reformation in the 16th century, St. Nicholas was frowned upon. In order to fill the void, various regions devised their own character. In Hessen he became “Pelznickle,” which means “Nicholas in Fur.” In Schwäben it was “Pelzmärtle.” In Rheinland Falls they pronounced the “P” as a “B” and he became Belznickle. The tradition spread as Germans emigrated to other countries. In Brazil Pelznickle flourished. “The northern Germans brought Belsnickle with them when they moved to Pennsylvania.” explained Jones. Indeed the Pennsylvania Dutch (which comes from Deutsch, i.e. Germans), still have the tradition of Belsnickle. Around 1870 papier-mâché composition Belsnickles began to be made in Sonneberg, Thuringia, Germany, for export. The crafting of Belsnickles there was fitting, as the area was already renowned for their expressive and beautiful dolls. A Belsnickle was formed in two plaster molds, front and back. Then the two halves were dried and joined together, finished and painted. Some were purely decorative; others were made into candy containers given to children at Christmastime. The Belsnickles’ hands are usually tucked tight inside their coat sleeves, but sometimes they strike a more relaxed pose. Some of them look a little hunch-backed. They have arresting faces, with expressive eyebrows, looking stern but wise. It is the perfect expression for meting out punishment for naughty behavior. While children were probably scared of Belsnickle, his image on a candy container was loveable in an overbundled sort of way. Jones has been collecting these fragile Belsnickle candy containers for 20 years, scouring antique shops, auctions and even Ebay. During this time she has watched the price increase from a few hundred dollars to literally thousands for a large Belsnickle in very good condition. Of course, she never forgets her first one. “I look at my first Belsnickle and he is not such a good one. Only about 5 inches high, and his tree is worn down to a wire, he has no color left, and his eyes are chipping away,” said Jones. But you can tell by the tone of her voice that she is like a mother describing a homely but well-loved child. He has earned a special place in her mirror-backed glass display cabinet. Artist Scott Smith of Rucus Studio in Michigan can sympathize. His Belsnickles hold a place of honor in a glass display case in his studio. He draws inspiration from their detailed faces. After working for years as a commercial artist and art director, Smith opened his own studio in 2000. Using a similar molding process, he sculpts his own whimsical characters – owls, moons, pumpkin-headed people – that look like they stepped from the pages of a story book. “I try to use the same methods, but we don’t have the same materials and recipes they had,” noted Smith. He related that the making of Belsnickles was truly a cottage industry. Whole families worked on the project, using their own hand-carved plaster molds and secret recipes for the papier-mâché or chalk “clay” that was pressed into them. It is remarkable that the candy containers survived not only their first opening by little fingers, but sometimes even being glued together to use as a Christmas decoration for generations to come. The variety of Belsnickles is truly amazing. They can be found with hooded coats of many different hues, from red, to deep plum purple, pink, yellow, white, blue, green and even sometimes brown. Often their coats sparkle with mica glitter or are trimmed with real fur. They perch in their black boots on snow-covered mounds or in front of trees. Many carry feather trees or baskets of toys, sometimes with a tiny American flag, as virtually all were made for export. Belsnickle fell out of fashion. German children became more interested in the Weihnachtsmann, who brought their presents on Christmas Eve. In the U.S. Santa Claus was becoming a jollier, happier old elf, helped along by the illustrations of Thomas Nast in the early 1880s and the red-suited Coca Cola Santa of the 1930s. Even so, another more sinister form of “the punisher” persisted in Austria. When Bill Steely of Westchester County, N.Y., attended his first Golden Glow of Christmas Past convention, the only family member willing to go with him was his then 6-year old daughter Chloe. Some eastern Germans still know Belznickle as Knecht Ruprecht. But Austria clings to a hooved and horned creature called Krampus. Chloe is now 19, and the Steelys have a full range of Krampus collectibles. But they also have a soft spot for Belsnickle. After all, fair is fair. Like many Belsnickle candy containers, this one separated at the boots to reveal an intact tube for stashing candy or a small toy. It sold for $7,000 in Bertoia Auctions’ September 2014 auction. Photo courtesy Bertoia Auctions. All Belnickles are fragile, but it’s especially amazing that this 20-inch figure with glass eyes and a glass icicle beard survived intact. The rare figure, standing on a mica-flecked snow mound and cradling a feather tree, fetched $17,000 at Bertoia Auctions’ November 2013 sale. Photo courtesy Bertoia Auctions. An unusual crowned Belsnickle, early 20th century, with yellow flocked trim sold at auction by Pook & Pook in October 2010 for $3,800. Photo courtesy Pook & Pook. This stunning 18-inch gold Belsnickle candy container brought $6,000 at Dan Morphy Auctions’ September 2011 sale. Photo courtesy Dan Morphy Auctions LLC. A few Belsnickles from the collection of Lorraine Jones. The Peabody, Mass., accountant says she often goes into the room where they are stored in a glass case just to look at them. Photo courtesy Lorraine Jones. Jones uses her Belsnickles to decorate with at Christmas time. Here a few Belnickles on her fireplace mantel with an advertising painting of Santa Claus by artist Fred Craft. Photo courtesy Lorraine Jones. This Belsnickle, with his fabric coat and soulful eyes, looks nearly like a modern-day Santa. Photo courtesy Lorraine Jones. Scott Smith’s collection of Belsnickles spend most of their time in a glass display case in his art studio. Photo courtesy Scott Smith, Rucus Studios, Michigan. A pair of figures from the collection of Scott Smith shows Belsnickle the punisher, with his bundle of sticks, and the Christmas Angel or Kristkind with a sack of presents. Photo courtesy Scott Smith, Rucus Studios. One of the typical ways Scott Smith uses his Belsnickles to decorate for the holidays. Photo courtesy Scott Smith, Rucus Studios. Bill Steely has assembled a collection of Belsnickles with exposed hands and relaxed poses. Photo courtesy Bill Steely. Compared to Belsnickle, Krampus is a really scary character. Here a decorative Krampus mask from the collection of Bill Steely, Westchester County, NY. Photo courtesy Bill Steely. Back view of the Brigitte IV shows its placement on sloping ground at Burg Kipfenberg. Riemerschmid’s simple wooden house has practical wooden shutters for privacy and insulation. Photo courtesy Quittenbaum Kunstauktionen GmbH. MUNICH – If you long to live in well-designed Arts and Crafts simplicity, an unusual object has come to market. Quittenbaum in Munich is auctioning an entire house designed in the early 1920s by renowned painter, architect and designer Richard Riemerschmid. There are only two strings: First, the dismountable house will come disassembled and the buyer will have to move it onto a suitable building lot for reassembly. Secondly, the building lot will have to be in Bavaria because the house is on the Bavarian A List of Historical Landmarks. Quittenbaum estimates that this 1926 example of the Brigitte IV will sell for between 100,000 and 150,000 euros ($127,000 to $190,000). The house is a fine example of Reform Architecture that appeared in Germany after World War I. Riemerschmid’s designs were offered by catalog and came in a variety of sizes. Customers could choose from many built-in furniture options, such as cabinets, display cases and sitting benches. Nut wood and oak gives the house interior a dark, yet cozy appeal. Riemerschmid also offered moveable furnishings that could be ordered at the same time as the house. Workers in dirty, overcrowded industrial areas were happy to move into the garden communities designed by Riemerschmid. The houses were simple but pleasant. The commute to work was short. This particular Brigitte IV is a mid-size, two-story example, crafted and assembled by the Munich company Kowalsky & Glasser. Its first location was Jaiserstrasse 33 in Pullach, near Munich. Renate and Peter Schuck, Jugendstil collectors and current owners of the house, lived out a dream by decorating it with Riemerschmid paintings, furniture, dishes, glasses, table linens and rugs, as well as the work of other period designers. It became a stunning private museum. Brigitte IV has nestled comfortably on the Schuck’s estate, Burg Kipfenberg in the Altmühltal, but now the couple is parting with not only with the house, but its amazing contents. Richard Riemerschmid’s work spans the gap between ornamental Jugendstil and sturdy British Arts and Crafts. Taking the grace from one and the practicality of the other, he created designs that were lovely, yet able to be produced in larger quantities. The Deutsche Werkstatten für Handwerkskunst, Hellerau (Dresden) and Meissen Porcelain were two of the companies that brought his designs to life. A portion of the auction lots set up in a cozy corner inside the Brigitte IV: wicker chairs by Theodore Reimann, Dresden, 1906 (estimate €1200 to €1500 – $1,500 to $1,900 per chair); oak long-case clock by Deutsche Werkstatten, Hellerau, 1908 (€800 to €1,000 – $1,200 to $1,275); open and lidded beer steins by Villeroy & Boch, 1900 (€150 to €300 – $190 to $382 per stein); blue Reinhold Merkelbach Narrow-necked vase, 1903 (€1,400 to €1,800 – $1,785 to $2,295). Photo courtesy Quittenbaum Kunstauktionen GmbH. In the dining room a Richard Riemerschmid carpet for the Villa Rittmeister Jännicke, Colmar, 1905 (€3600 to €4500 – $4,590 to $5,700); clever oak corner cabinet by Deutsche Werkstatten, Hellerau, 1911 (€800 to €1,200 – $1,020 to $1,500); and on the wall, one of Riemerschmid’s own landscape paintings, 1932 (€1,500 to €2,000 – $1,900 to $2,550). Photo courtesy Quittenbaum Kunstauktionen GmbH. Large covered porcelain dish designed by Richard Riemerschmid for StPM Meissen, 1903-05. Estimate €600 to €700 ($765 to $893). Photo courtesy Quittenbaum Kunstauktionen GmbH. Called “Sonntagsreiter” (Sunday Rider), this wooden toy circa 1904 comes with a separate paper that depicts the rider in different positions. Richard Riemerschmid, Dresdener Werkstätten. Estimate €800 to €1,200 – $1,020 to $1,530. Photo courtesy Quittenbaum Kunstauktionen GmbH. The larch wood bed from the main bedroom of the Brigitte IV. Richard Reimerschmid, Dresdener Werkstätten, 1905. The house also has a girl’s bedroom. Photo courtesy Quittenbaum Kunstauktionen GmbH. Richard Riemerschmid covered stoneware punch bowl in celadon green and cobalt made by Reinhold Merkelbach, Grenzhausen, 1906. Estimate €600 to 800 – $756 to 1,020. Photo courtesy Quittenbaum Kunstauktionen GmbH. Hans J. Wegner lounges with some of his most memorable chairs. Photo courtesy Design Museum Denmark. SAXONY, Germany – Mass-produced furniture before 1950 had a tendency to be dark, ponderous and often uncomfortable. But in 1949 one man’s personal search for comfortable, well-designed seating resulted in a sensation that changed what everyone wanted in their living rooms. “Just One Good Chair,” documents designer Hans J. Wegner’s search for the perfect place to sit. This extensive exhibit at Design Museum Denmark in Copenhagen is on display through Dec. 7, and worthy of a trip from nearby Germany for all Danish Modern enthusiasts. Even as a student at the Danish Furniture School, Wegner’s brilliance was combining streamlined shapes with a perfect balance of form. His drawing for a set of silverware, unadorned and with a simple tapering at the top and bottom of each utensil, hinted at his future style. Wegner’s modernism was inspired by simple tools humans have used for centuries. One only need say “boat paddle” to really understand the flaring and narrowing of the wooden arms of his chairs, “spear” to define their tapering, pointed legs. When Wegner’s new design for a chair appeared at the Cabinetmakers Guild Exhibition in Copenhagen in 1949, it was the antithesis of traditional furniture. Appearing light in weight because of its open-backed design and light in color due to its natural wood, “The Round One” as Wegner referred to it, was refreshingly spare, yet comfortable. Interiors magazine published an article on “The Chair” in 1950, and America went crazy for the new style. The Chair was launched it into mass production, nervously supervised by Wegner to ensure quality of craftsmanship was not compromised. The style became so popular that CBS bought Wegner chairs for the televised Nixon-Kennedy presidential debates. Wegner never stopped pushing his idea of creating the perfect chair, designing more than 500 seating options and continuing to make them larger, more aesthetically pleasing and more comfortable. Although Wegner died in 2007, his work continues to inspire designers. It is also highly collectible. Depending on age, materials and condition, you can expect to pay upwards of 800 euros ($1,000) for one of his simple chairs. Design Museum Denmark’s exhibit displays so many of the design highlights of Wegner’s very productive life. And unlike many such exhibits, you can actually sit in some of the chairs. If you do venture to Denmark, the Fuglsang Kunstmuseum situated in the wildly remote landscape of the island of Lolland is not to be missed. It showcases an excellent overview of Danish art history, with masterworks by P.C. Skovgaard and Anna Ancher. The white cube-like building designed by British architect Tony Fretton is, itself, a part of the artwork. A special room designed with glass walls looks like three paintings, but it is actually a framed view of an ever-changing landscape of stormy skies and lazily moving sheep. ‘The Chair’ in all its color variations. Wegner’s design had the ability to stack, making it good for mass production and transport. Photo by Heidi Lux. Wegner’s design for the Wishbone Chair from 1950. Photo courtesy Design Museum Denmark. Eye-popping, yet simple in design: Wegner’s Two-Part Shell Chair from 1963. Photo by Heidi Lux. The Fuglsang Kunstmuseum sits in a dramatically lonely location, yet houses examples of the important periods in Danish art history. Photo by Heidi Lux. The rare School set by Steiff with its delightful tiny details like a functional abacus and a chalkboard. Photo courtesy Ladenburger Spielzeugauktionen. LADENBURG, Germany – Seeing a museum close is never a happy event. But when Katharina Engels shut the door of her doll and toy museum in Rothenburg ob der Tauber in January, it turned out to be a joyous culmination of her life’s work. For 30 years she shared her expertise and affection for toys with more than 2 million visitors. Now it was time to share her favorites one last time with collectors who would treasure them as much as she had. Ladenburger Spielzeugauktionen, with whom Engels had worked closely to build her collection, is marking a milestone of its own in 2014 – 25 years in business. Although auction houses in the U.S. and Asia were interested in auctioning Engel’s collection, she chose to return to her trusted friend Ladenburger to hold the sale. More than 1,300 lots were auctioned to an appreciative audience, among them a rare School by the German toy maker Steiff. Its charming school desks, lesson books and round-faced student dolls went from an opening bid of 2,800 euros to an end price of 15,500 euros. Lot 1144 was a breathtaking dollhouse decorated as a Vienna Café in the Biedermeier style with gothic details. The café came complete with pastry-filled glass cases and guest dolls in their original 1880 finery. It was quickly bid from 3,800 to 16,500 euros. Great interest was shown in a Humpty Dumpty Circus made by the German emigrant toymaker Schoenhut in the USA. The colorful tent and jointed figures, including a strong man, elephants and clowns, brought 8,000 euros. Auktionshaus Kaupp, Sulzburg, rings in their 20th year in business with a two-part anniversary sale June 27 and 28 at Schloss Sulzburg. Founded in 1994 in Staufen, Kaupp has built something of a reputation for auctioning paintings by Carl Spitzweg. But more recently their art and antiques sales have featured outstanding contemporary art. “Kaupp Modern” on June 27 continues this with works such as Lyonel Feininger’s sketchy watercolor Standansicht mit Kirche; a spontaneous pastel and ink piece by Hans Hartung; and the super-8 film and tape Der Tisch, shot by Dietmar Kirves, capturing a work by Joseph Beuys and his students in Dusseldorf, 1968. The estate of Barons Ruprecht Böcklin zu Böcklinsau, the last owner of Schloss Balthasar in Rust, is an absolute high point in ”Kaupp Premium” on June 28. Countless pieces of furniture and collector’s objects from the Baroque and early Baroque periods will be brought to the market. They join an already rich selection of handicrafts, antiques including Jugendstil and Art Deco, and paintings from the 16th to 19th centuries. In celebration of their 125 years of family history as auctioneers, Münzenhandlung Gerhard Hirsch Nachfolger has moved into spacious new quarters in the Pranner-Plenum, the site of the former Bavarian State Parliament in Munich. The auction company, which specializes in coins, medals and antiquities, also buys and sells bullion. Hirsch owner, Dr. Francisca Bernheimer, can trace her auction lineage back to her grandfather, Konsol Otto Bernheimer, who was the director of art auction Haus Bernheimer, founded in 1864. Her father, Dr. Ludwig Bernheimer, was also a director of the company. Everyone loves a circus. This one, by toymaker Schoenhut, finished at 8,000 euros. Photo courtesy Ladenburger Spielzeugauktionen. This lovingly detailed Vienna Cafe, only 69 x 57cm, lot number 1144 in the Ladenburger Spielzeugauktionen, rose from an opening bid of 3,800 euros to 16,500 euros. Photo courtesy of Ladenburger Spielzeugauktionen. This angular watercolor by Lyonel Feininger, 1955, will appear in the Kaupp Modern sale. Photo courtesy Auktionshaus Kaupp. Spontaneous and brushy, with vivid color, is this typical pastel and ink work by Hans Hartung. Photo courtesy Auktionshaus Kaupp. This untitled bronze sculpture by Italian Transavantgarde artist Mimmo Paladino, is the second of four versions of this ghost-like figure. Photo courtesy Auktionshaus Kaupp. Greek artist Jannis Kounellis, one of the founders of the Arte Povera movement, is known for working with natural and industrial materials. The 1989 Assemblage is created of steel, glass, coal, and human hair. Photo courtesy Auktionshaus Kaupp. This iron red and green Dragon Plate is a highlight of Auktionshaus Kaupp’s Asian portion of the sale. The plate from the Zhenghde Period depicts a five-clawed dragon, meaning it was reserved for use only by the Emperor and his highest-ranking officers. Photo courtesy Auktionshaus Kaupp. This vivid and delicately painted enamel and silver icon by Ivan Petrovitch Khlebnikov, 1882, Central Russia, brought 36,000 ($49,300) at a past Dr. Fischer auction. Photo courtesy Dr. Fischer Kunstauktionen. GEITHAIN, Germany – A family trip just brings my ulterior motives to the fore. Are there any spectacular auctions coming up at our travel destination, any sumptuous antique shows, and, of course, any art galleries not to be missed? Feb. 28-March 2: Art Fair in the classical beauty of the Handelskammer Hamburg, near the city hall in the heart of Hamburg. Antique and art dealers present for the first time in this brand new show coordinated by Mendelssohn Messen & Ausstellungen GmbH. June 28: Dr. Fischer Kunstauktionen in Heilbronn presents their 25th glass auction in Zwiesel, a city with a 700-year glassmaking tradition. Collectors flock to this very special event, where last year nearly 900 pieces of rare, sparking glass were auctioned. Oil on canvas painting by Czech artist Vilém Kreibich, estimated at 30,000 Czech Koruna ($1,500). Photo courtesy Dorotheum. Hasselblad 500 “EL DATA CAMERA HEDC” used by U.S. astronaut Jim Irwin on the fourth NASA mission in 1971. “Camera 1038,” is the only one of the 14 cameras used to return to earth. The astronauts chose to take the film and leave the cameras behind, returning instead with an equal weight in moon rocks. Estimate 150,000 to 200,000 euros ($203,000 to $271,000). Photo courtesy Westlicht. Jugendstil sculpture of tiptoeing woman by Ferdinand Preiss. Estimate, 7,000 to 9,000 euros ($9,400 to $12,200). Photo courtesy of Quittenbaum Kunstauktionen. This Berlin porcelain pedestal bowl by KPM, 1837-44, with its fine gold accents and brass mount, doubled its estimate to fetch 20,000 euros ($27,400) in 2012. Photo courtesy Van Ham Kunstauktionen. The colorful and charming world of plastic Wiking Models at Auktionshaus Saure in Cologne. Photo courtesy Auktionshaus Saure. This stately linen damask tablecloth and 12 napkins, circa 1880, is embroidered with a red ‘HH’ monogram. Photo courtesy Auktionshaus Mehlis. Six-arm silver candelabra, 1898-99, by Henry van de Velde, part of the exhibit at Musées royaux ď Art et Histoire, Brussels, © VG Bildkunst, Bonn, 2013; photo courtesy Klassik-stiftung, Weimar and used with their permission. MUNICH – Jugendstil was an invisible lightning strike that caused a complete about-face in artistic style. Sometime around 1890, it appeared in Germany like a blossoming vine and twined itself around Historicism, obliterating its classical-lines with the sinuous curves of nature. The new style, also known as Art Nouveau, was a synchronicity that touched Gustaf Klimt and the Secessionist artists in Vienna, painter Alphonse Muncha in Moravia, illustrator Audrey Beardsley in England, and glass artist René Lalique in France. It even negotiated the Atlantic Ocean, appearing in the designs of Louis Comfort Tiffany in New York. At the forefront of the Jungendstil movement was Belgian-born artist and architect Henry van de Velde. In celebration of the 150th anniversary of his birth, Quittenbaum Kunstautionen, Munich, has planned a special auction Dec. 10 featuring his work. “The 150th birthday is being celebrated by many museums, and since our strength is Jungendstil, we thought we must have an auction,” noted Managing Director Askan Quittenbaum. Although he admitted it was not easy to accumulate a large number of works from such a well-loved and enthusiastically collected designer, the auction house has managed to gather a respectable selection of Van de Velde objects, rounding out the sale with exquisite works by contemporaries such as glass artist Emile Gallé and architect and designer Josef Hoffmann. “Henry van de Velde saw it as a challenge to design the entire artwork from a to z,” said Quittenbaum. “He was using the same methods as William Morris in the Arts and Crafts movement, which just isn’t the case with artists today,” said Quittenbaum. Indeed Van de Velde, who had studied painting in Antwerp, left this path to embrace the fuller possibilities of architecture and design. His use of flowing curves caught the eye of Karl Ernst Osthaus, founder of the Volkwang Museum, who asked him to design the museum’s interior. Shortly after 1900 Van de Velde became director of the Groβherzoglich Sächsischen Kunstgewerbeschule in Weimar, a post he held until 1915. In 1919 the school was renamed Bauhaus, expanding upon Van de Velde’s theory that even useful objects could be well-designed works of art. Perhaps managing so many different artistic disciplines at the school inspired Van de Velde, for he was as comfortable drawing the sweeping lines of a house as he was designing a book cover, clothing, cutlery or china. Like architect and designer Frank Lloyd Wright, he viewed well-designed accessories as an integral and harmonious part of the entire architectural object. Quittenbaum’s offers a couple of these lovingly designed details, such as Lot 28, a swooping brass door handle from Hair Salon Haby in Berlin, 1901. Lot 61 is four simple silk handkerchiefs embroidered with a Van de Velde designed monogram, created at the same time as a set of table linens for the grandparents of painter Curt Herrmann, circa 1906. To see how architecture and art united in a van de Velde project, Jungendstil enthusiasts can tour several historic sites. Weimar highlights include Haus Hohe Pappeln, the home he designed for his wife and five children in Weimar, 1907; the Friedrich Nietzsche Archives, where he was asked to redesign the interior by the late philospher’s sister in 1902; and naturally the former Kunstgewerbeschule. Henry van de Velde at work in his studio, circa 1908. Photo by Louis Held, © Klassik-stiftung, Weimar and used with their permission. Oak music cabinet by Henry van de Velde from the music room of the Folkwang Museum, circa 1902. The simple rectangular form is accented by a curving raised border on the cabinet door. Estimate 16,000-18,000€ ($21,500-$24,000). Photo courtesy Quittenbaum Kunstauktionen, GmbH. The delightful contrast of color, curved arches and flaring vertical lines made Van de Velde’s Jugendstil Villa Esche in Chemnitz (1902-03) seem futuristic for its time. Photo courtesy Villa Esche. Detail of Secessionist architect Otto Wagner’s Jugendstil train station in Karlsplatz, Vienna. Photo by Heidi Lux. Emile Gallé vase, Rose de France, dedicated to his daughter Thérèse, Dec. 28, 1901. Estimate 120,000-160,000€ ($163,000-$217,000). Photo courtesy Quittenbaum Kunstauktionen, GmbH. A prime piece in Quittenbaum’s Dec. 10 auction is this silver belt fastener in butterfly form by Henry van de Velde, 1898-99. Set with Ceylon moonstones and diamonds; provenience the Osthaus family. Estimate 40,000-60,000€ ($54,000-$80,000). Photo courtesy Quittenbaum Kunstauktionen, GmbH.